Nihad Awad, the Council on American-Islamic Relations (CAIR) executive director, is in Turkey this week. It isn't clear why, but Awad is taking advantage of his travels to post upbeat photographs celebrating that country's recent failed military coup. Last month, a faction of Turkey's military tried to oust Islamist President Recep Tayyip Erdoğan, who has consolidated power and steered his country away from the secular ambitions laid out by modern founder Mustafa Kemal Ataturk toward a decidedly Islamist state. "For almost ten years, Turkey has been drifting towards authoritarianism. Life has become distinctly uncomfortable for anyone who doesn't support Erdoğan and his party, the AKP. The government controls the news media, has undermined the rule of law and clamped down harshly on any kind of peaceful protest. So while Turkey is still democratic—in that Erdoğan is elected—it is not a liberal country." Last Friday, Turkish journalist Mahir Zeynalov captured one aspect of Erdoğan's latest crackdown, the arrests of dozens of journalists, in a series of Twitter posts that garnered immediate international attention. Awad hasn't seemed to notice or doesn't care. On Saturday, he posted a photograph of a bridge where, he said, "the army surrendered to the will of the people." 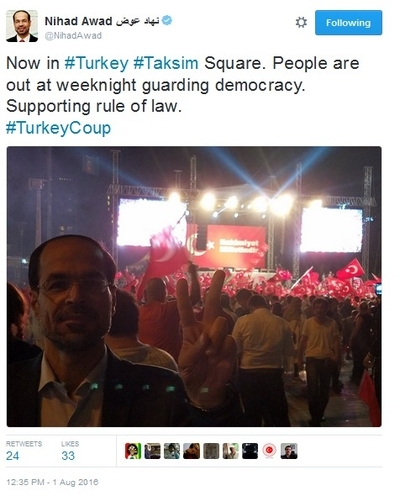 Monday evening, he snapped a selfie in Turkey's Taksim Square, showing what looked like a rally of flag-waving Turks "guarding democracy." True, Erdoğan was elected president by popular vote in 2014. But his actions, seizing opposition media outlets, purging military, the courts and government of potential foes and increasing Islam's role in Turkish society, predates the failed coup. But Erdoğan's crackdown, described by the New York Times as "nearly unprecedented" in modern history, has not stopped his American Islamist supporters from fully embracing Turkey's tilt toward a more theocratic state. In a series of White House rallies that started the night of the failed coup, speakers including Awad cast Turkey as a beacon of freedom. "This military coup is an affront, not only to the Turkish people, but to everyone who believes in democracy and the free will of the people," Awad said at another White House rally July 15. Bedier: What do we want? Bedier: When do we want it? 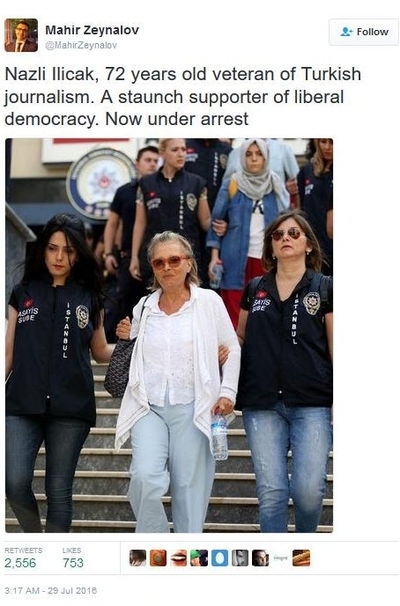 "Turkey's what democracy looks like!" Before the outcome was known, CAIR's San Francisco chapter director Zahra Billoo wrote that she "will always support democracy over military coups." Three days later, she seemed dismissive over calls for restraint in any Turkish reaction. The United States would do the same thing, she wrote. Billoo is an attorney and serves on the National Lawyers Guild's board of directors. Yet, she asserts the United States might conduct mass arrests of military personnel, academics and journalists. Media reports indicate that Turkish troops rounded up for suspicion of being tied to the attempted coup have been tortured. Amnesty International criticized Erdoğan's government for accelerating its assault on critics, especially "on a media already weakened by years of government repression." The latest response "leaves little room for doubt that the authorities are intent on silencing criticism without regard to international law." More than 15,000 people have been detained since the failed coup. Awad, Bedier and their fellow American Islamists have held their tongues about this systemic abuse, despite their claim of support for human rights. And Awad is actively hyping Turkey as a place worthy of support. Last month, before the coup attempt, we documented the close ties between American Islamist groups and Erdoğan. Awad was photographed with Erdoğan during the Turkish president's April visit to the United States. A coalition of U.S. Islamist groups, including CAIR, issued a statement in 2015 taking Turkey's side in the debate over the 1915 massacre of Armenians in Turkey, which rails at any government or entity which dares to call it genocide. "As Americans, we are concerned about alienating a key ally, Turkey, through one-sided declarations that political and religious leaders have made on this subject," the statement said. Erdoğan also has shown love for the founding wing of the Muslim Brotherhood, which was created in Egypt in 1928 with a goal of restoring a global Islamic state. Turkey opened its doors to Brotherhood officials chased out of Egypt a coup ousted President Mohamed Morsi, the head of the Muslim Brotherhood's political party. Turkey also rolled out a welcome mat for senior leaders of the Hamas military wing, including those responsible for bloody terror attacks. Since early last year, Turkey also has been home to Sami Al-Arian, the former University of South Florida engineering professor who moonlighted on the Palestinian Islamic Jihad's governing board. Al-Arian all-but accused Israel of being involved in the coup and defended the resulting government crackdown in an English-language Turkish television interview. Awad's involvement with the Muslim Brotherhood in America was exposed by the FBI in 2007 as a result of its investigation of Hamas-financing by the Texas-based Holy Land Foundation for Relief and Development. A telephone list covering members of the Brotherhood's "Palestine Committee" in the United States included Awad and fellow CAIR officers Omar Ahmad and Nabil Sadoun. 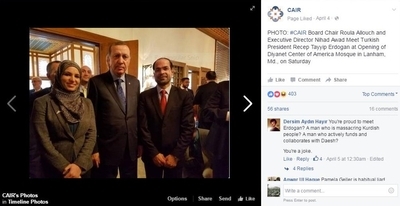 This and other evidence linking CAIR to the Brotherhood's Hamas-support network prompted the FBI to cut off interaction with CAIR "until we can resolve whether there continues to be a connection between CAIR or its executives and HAMAS." Your so called journalists Nihad Awad, Ahmed Bedier, Zahra Billoo, Mahir Zeynalov are not Turkish origin. They do not represent any Turkish media. Therefore, anyone who reads this article should be aware of the fact that the coup attempt was performed by a group of officers inside the armed forces which are embedded into army by the Gulen Action.